Dr B E Ley, Department of Paediatric Oncology, Bristol Royal Hospital for Sick Children, St Michael’s Hill, Bristol BS2 8JS. 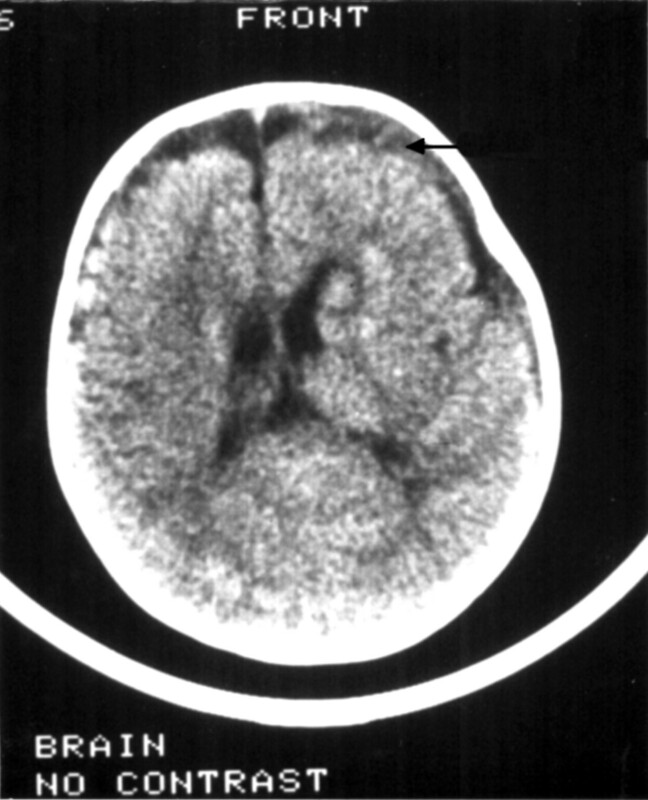 Computed tomography revealed a frontal empyema in an 8 month old boy who presented with a prolonged convulsion. Before admission he had received oral antibiotics and all specimens were negative on culture. The presence of bacteria in cerebrospinal and empyema fluid was demonstrated using the polymerase chain reaction (PCR) with 16S rRNA gene primers. A presumptive identification of Streptococcus pneumoniae was made by comparison of PCR products with those derived from known bacteria using denaturing gradient gel electrophoresis. Bacterial meningitis in childhood has significant mortality and morbidity. Accurate diagnosis is therefore important for optimum treatment and care. Bacteriological diagnosis has relied traditionally on microscopy and culture. The identification of a disease causing organism is becoming increasingly important with the emergence of antibiotic resistance. The polymerase chain reaction (PCR) offers an approach to the diagnosis of infectious disease independent of culture techniques and allows bacteria to be identified in clinical samples even in the presence of antibiotics. PCR diagnosis of meningitis has been reported using specific PCR for a given bacterium1 and with two rounds of PCR using various primers.2 We describe the application of a single step PCR with the separation of products using denaturing gradient gel electrophoresis (DGGE). DGGE is a technique which separates DNA fragments of the same length but with different base pair sequences, according to the point at which they denature.3 Primers were made to the universal and highly conserved regions of the 16S rDNA gene flanking a variable region 193 base pairs long. When amplified by PCR these products were separated using DGGE. This approach, previously applied to profile complex microbial populations,3 allows single step PCR to be used as a diagnostic tool. A previously healthy 8 month old boy of Somali parents was admitted with a prolonged right sided convulsion. There was a family history of tuberculosis, both his father and his paternal grandmother having received treatment in the past. Five days before admission he developed watery diarrhoea, vomiting, and fever, becoming lethargic with reduced fluid intake. Oral cefaclor, for otitis media, was prescribed but he continued to deteriorate. His admission was precipitated by a sudden onset right sided convulsion, initially involving the face but spreading to involve the upper and lower limbs on that side. His convulsion was controlled with intravenous diazepam and phenytoin. Examination showed him to be 10% dehydrated. General examination, including ear, nose, and throat examination, was normal. In the postictal period he was drowsy but responsive to pain. Pupils were constricted and responded to light. There was no facial asymmetry. Tone was generally reduced but symmetrical, reflexes normal, and both plantar reflexes upgoing. No neck stiffness was noted but the fontanelle was full. Initial investigations included computed tomography of the skull which showed a bifrontal subdural empyema (fig 1). The results of other relevant investigations were as follows: haemoglobin concentration 8.6 g%; total white blood cell count 11.1×109/l; platelet count 28×109/l; coagulation screen: international normalised ratio 1.0, activated partial thromboplastin ratio 1.7; renal profile normal apart from a plasma creatinine of 269 μmol/l; chestx ray and echocardiography normal. Blood cultures were taken before starting treatment with cefotaxime, flucloxacillin, and metronidazole. He then underwent drainage of the empyema and insertion of an intracranial pressure transducer. At operation pus was found in the subdural and subarachnoid spaces, with inflamed meninges. Initial computed tomography without contrast showing the frontal empyema (arrowed). His temperature settled over the next three days. The postoperative course was complicated by disseminated intravascular coagulation and acute renal failure which resolved with conservative management and peritoneal dialysis. Neurologically he made a steady recovery. One week after surgery, he was responding normally to his mother, fixing and following, and taking feed enthusiastically. His limb movements were normal, as were limb tone and reflexes. He remained on phenytoin which was later substituted with carbamazepine. Four and a half weeks after admission he was discharged. DNA was extracted from both the cerebrospinal fluid and empyema samples by centrifugation and washing and then using the GeneReleaser kit (Cambio, Cambridge) following the manufacturer’s procedures. The resulting extract was used directly in a PCR reaction. The PCR reactions were performed in a total volume of 50 μl with a concentration of 0.1 μM of each primer p2 and p3.3 The entire 12 μl product of the GeneReleaser kit was used in the PCR reaction. The reaction mixtures were incubated for three minutes at 94°C. Thirty cycles of PCR were performed using a thermal cycler (Omnigene, Hybaid, Teddington) consisting of a denaturation step for 30 seconds at 94°C, an annealing step for one minute at 65°C, and an extension step for one minute at 72°C. After the final cycle there was a step of seven minutes at 72°C. Control samples containing all reaction constituents except genomic DNA were run along with the samples containing DNA. Sequencing was performed on the sample bands to confirm the presumptive identification. The PCR product were sequenced directly using the p3a primer (the same as p3 but without the GC clamp) on the ABI automated sequencer. The sequences were analysed using the FASTA program from the Winsconsin GCG package suit of programs CCL (Daresbury Laboratory6) to give sequence alignment and percentage identity. Microscopy and culture of the blood, pus, and cerebrospinal fluid showed no organisms, and Mantoux (1/1000 PPD) was also negative; serological investigations were not carried out in this case. Amplification of the extracted DNA from cerebrospinal fluid and pus samples resulted in a 240 base pair product. These products were separated by DGGE and the resulting product aligned closely with the product from a pure culture of S pneumoniae (fig 2), allowing presumptive identification. The identity of the bacterium was confirmed by PCR for the pneumolysin gene7 and by sequencing the 16S rDNA product. This gave more than 90% identity with the 16S rDNA of S pneumoniae. DGGE showing alignment of cerebrospinal fluid and empyema samples with S pneumoniae. 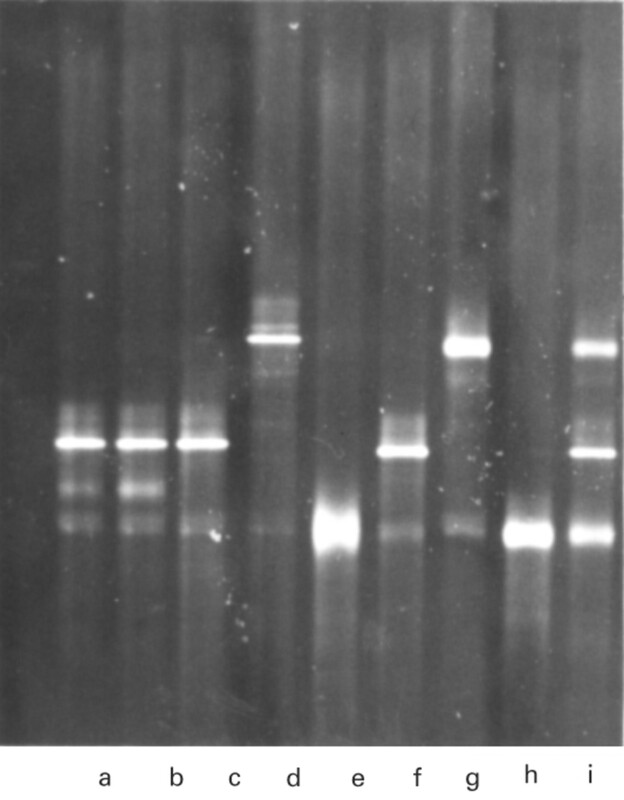 Although molecular techniques are not yet universally available or perfected, this simple one step PCR gave a presumptive bacteriological diagnosis within 24 hours where more traditional methods had failed. The emergence of antibiotic resistance will increasingly necessitate accurate identification of bacterial causes of infection. PCR using eubacterial primers and DGGE can be used even when the potential causes of infection are diverse or polymicrobial. (1991) Rapid diagnosis of meningococcal meningitis by polymerase chain reaction. Lancet 337:1658–1669. (1994) Detection of bacterial DNA in cerebrospinal fluid by an assay for simultaneous detection of Neisseria meningitidis, Haemophilus influenzae and streptococci using a seminested PCR strategy. J Clin Microbiol 32:2738–2744. (1993) Profiling of complex microbial populations by denaturing gradient gel electrophoresis analysis of polymerase chain reaction-amplified genes coding for 16S rRNA. Appl Environ Microbiol 59:695–700. (1985) Nearly all single base substitutions in DNA fragments joined to a GC-clamp can be detected by denaturing gradient gel electrophoresis. Nucleic Acids Res 13:3131–3145. (1996) Application of 16S rRNA gene PCR to study the bowel flora of preterm infants with and without necrotising enterocolitis. J Clin Microbiol 34:2506–2510. (1990) Rapid and sensitive sequence comparison with FASTP and FASTA. Methods Enzymol 183:63–98. (1993) Evaluation of the polymerase chain reaction of pneumococcal pneumonia. J Clin Microbiol 31:2661–2666.